The below article was originally culminated by myself in the late 90s when I was working on a web site for Chas. It's sources include numerous magazine and news paper articles on Chas during the late 80s and early 90s. Chas had prepared a box of articles, slides, posters, books, and art work for me in 1999. Many of the treasures he shared with me are OOP or just so damn rare no one knows they exist. I plan on sharing Chas' work with the online world, in an attempt to keep his legend living on. There is a well known tribute site to Chas online, I actually created it years ago but had a falling out with the web host. Regardless, we purchased Chas' old domain and I plan to put all of his work on the web site for free download. So all Balun fans, please keep peeled to the definitive Chas Balun source, ChasBalun.net! Chas. Balun lived near Hollywood, California and has loved monsters, zombies, and alien life forms since birth. 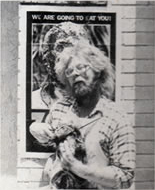 Balun was an unrepentant hippie who also enjoyed drawing, painting, blues guitar, collecting books, and chainsaw chooglin. From the outside, Chas. Balun's house in Westminster looked like every house on the block. Even the inside appeared normal, until you noticed a few items not found in most average households: a severed hand on a table near the door, a cadaver sitting in the dining room, a leg dangling from the ceiling in the study. Not to worry, though. Balun was not a deranged fugitive from justice. The body parts are a few of the props that he had collected over the years. Balun, however, was not your average collector. He was a horror film aficionado, and had written extensively on the subject. 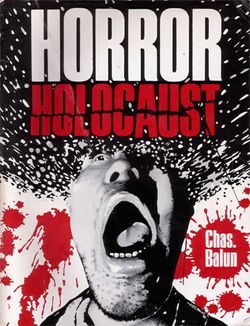 Balun was the creator and founding editor of the horror film magazine Deep Red. If this all sounds a little horrible, it is horribly fun. Americans spend millions of dollars a year to watch horror films. A much smaller number of fans are avid readers of horror film magazines like the ones Balun wrote for. The magazines contain reports on horror films, behind-the-scenes stories, retrospectives on older films, and a lot of how-to articles on special effects. Charles Balun, Chas. for short, had built up an international cult following among fellow "gorehounds" by writing serious criticism of horror movies. In "The Connoisseur's Guide to the Contemporary Horror Film, "Balun critiques themes, acting, special effects, editing, cinematography and cinematic roots. "Sometimes they don't bear the scrutiny I give them," he concedes, nothing that he considers some of the films "unimaginative, dull, brain-dead." The Huntington Beach graphic artist, who cheerfully admits he is obsessed with gore and monster movies, had sold thousands of the guide and his other book, "The Gore Score," to bloodthirsty movie-goers around the world. Balun had loved the film genre since childhood and had lost no enthusiasm. He says he spent as many as 30 hours a week on his hobby and "about as much money as a singles-bar hustler would spend on drinks and the juke box." Watching once again the remake of "The Thing" on a television set in his living room, he marveled at the special effects depicting the monster. "Absolutely incredible-doesn't that look real?" he asked. "That's no guy in a suite!" Balun liked his favorite move "The Texas Chainsaw Massacre" so much he had seen it over 15 times. He sat through the original "King Kong" and "The Thing" 20 times each. After years of watching horror movies and collecting magazines and books about them, Balun wrote his first book, "The Connoisseur's Guide," in 1983. He rates on a scale from one hatchet to three hatchets. His criticism is serious. About "Night of the Living Dead" he wrote, "The swift and deadly ironic twist to the ending shows Romero (the director) was not simply intent on retelling another tale of the walking dead but commenting on the suspicions, hostility, selfishness and paranoia inherit and in us all." 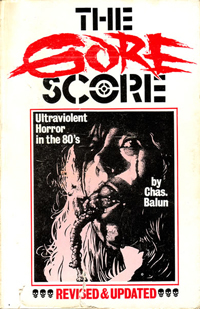 In his second book, "The Gore Score," Balun took a lighter approach, rating the films on both merit and quantity of blood shown. Of "Schizoid" Balun wrote, "Frustrated yo-yo kills women in women in encounter groups and hot tubs with big scissors. Forgettable drivel with an alleged surprise ending." "The Gore Score" received a rave review in the magazine Fangoria, which is circulated around the world. Balun gleefully showed the review, which calls him a genius to visitors to his home. He emphatically repeated, "I didn't write that and I don't know that guy. He keeps fan mail, some splattered in blood, in his study, which is decorated with movie posters designed to make a person's flesh crawl. Above the ghoulish pictures the posters proclaim "Maniac, "Demented","Motel Hell", and "I spit on your Grave." Balun sometimes would carry his hobby into real life. Once when he and his wife returned home unexpectedly early from vacation, Balun's brother-in-law, who lives with them, was taking a shower. The towering Balun dressed up as Leatherface in "The Texas Chainsaw Massacre"-white mask with holes for the eyes and nostrils and a butcher's apron smeared with fake blood. He waited until his unsuspecting brother-in-law emerged from the bathroom and then leaped at him, shrieking and brandishing a machete. Balun's wife Pat encourages his hobby. "Anyone who would stand with me in the rain at 12:30 a.m. in downtown L.A. to see the West Coast premier of "The Evil Dead" is someone I can spend the rest of my life with." he said.